Beadwork of geometric quadrangular designs and strands of beads in alternating colours. At both ends of the geometric pattern, there is a white figure with a white animal-like figure at the centre. 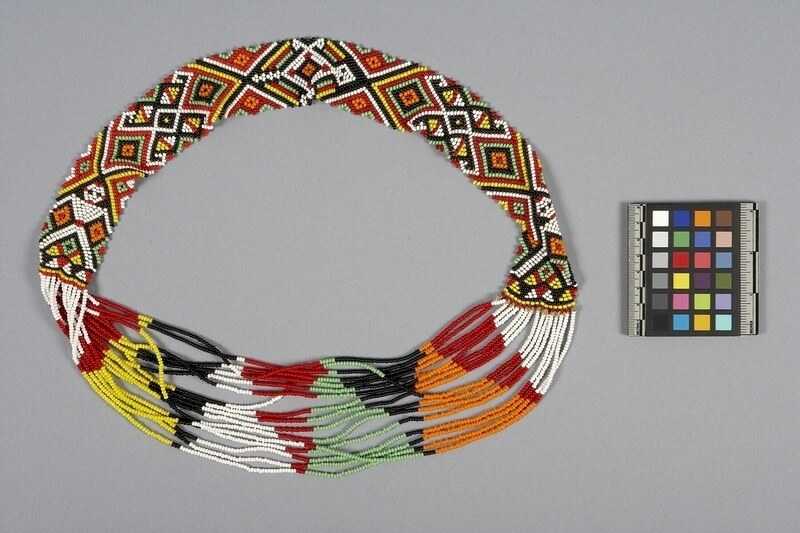 Symmetrical pattern from the white centre, alternating coloured strands of beads, starting white, then, red, yellow, black, white, red, green, black, orange, red, and white. The bead strands get progressively longer as they move out from the inner circle. Beads worn by the bride and groom diagonally across the chest (collector's notes). Worn as part of wedding attire. Collected by David Black and Ali Gaskell while working for CUSO in Borneo between 1973 and 1975.